The Detroit Tigers have lost their new ace to an elbow injury. The Tigers placed reigning American League Rookie of the Year Michael Fulmer on the 10-day DL Thursday because of elbow inflammation. An MRI of Fulmer’s right elbow showed both inflammation and a build up of fluid, which is enough to land him on the deal. Fortunately for Fulmer and the Tigers, the MRI revealed no structural damage. Fulmer is no stranger to his current ailment. He’s struggled with numbness in his fingers as a result of elbow inflammation throughout his pro career. However, the numbness has become more problematic in recent weeks. Fulmer will be shut down for at least a week and take anti-inflammatories to help combat the issue. If the Tigers were in contention for a playoff spot, Fulmer may have been able to talk the Tigers into leaving him in the rotation. But with Detroit eight games under .500, there’s no sense in taking a chance with the 24-year old Fulmer, who believes he could continue to pitch through the issue. Fulmer has actually been roughed up a little in two of his last three outings. Monday against the Yankees, he allowed seven runs in six innings of work. Two starts before that, Fulmer lasted just 2.2 innings against the Royals, yielding eight runs, although only five were earned. Those two starts are the only blips on an otherwise excellent follow up to his Rookie of the Year campaign last year. Through 21 starts this year, Fulmer is 10-9 with a 3.59 ERA. During Monday’s start against the Yankees, Fulmer felt a tingling sensation in his ring finger and pinkie. He says he typically experiences that sensation after a start, not while he’s on the mound. That numbness began to have a negative effect on his pitches, particularly his changeup. That made the Tigers more inclined to put him on the DL until the issue subsides. 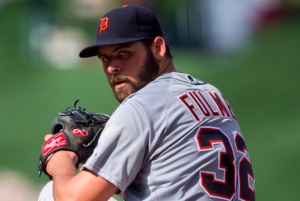 To say that Fulmer is an important part of Detroit’s future would be an understatement. Thus far in 2017, Fulmer has proven that his outstanding rookie season was no fluke. With Justin Verlander’s future in Detroit uncertain, it’s likely that Fulmer will become the team’s ace; if he’s not already there. He’s pitched like an ace for much of this season, outperforming Verlander. When it comes the Fulmer’s health, the cautious approach the Tigers are taking is the right approach.